The intent of the Growth Plan is to direct growth to existing built-up areas and areas of intensification, particularly Urban Growth Centres. The Growth Plan identifies 25 such centres throughout the region. Urban Growth Centres are to serve as "focal areas for investment in institutional and region-wide public services, as well as commercial, recreational, cultural and entertainment centres... [and as] high density major employment centres" (MPIR, 2006, 16). This research compared the locations of these Urban Growth Centres with patterns of consumer travel to TTS zones containing power centres and enclosed malls (Figures 14 and 15). It appears that consumer traffic flows to power centres and malls are concentrating a few kilometres away from the planned Urban Growth Centres (Figure 15).18 The data indicate commercial development processes that encourage consumer travel to power centres in the peripheral or "unplanned" gaps of the GTA, close to and generally outside areas designated for intensified development. The pattern of trips to power centres is an artefact of both the spatial organization of the Urban Growth Centre network and retail intelligence. 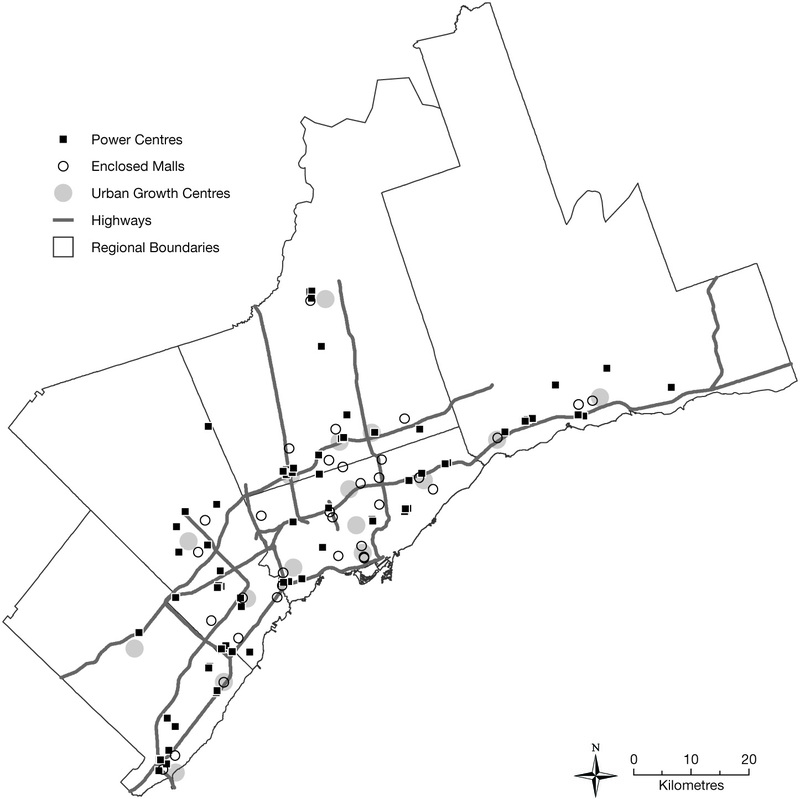 That is, several of the Urban Growth Centres, although they have recently developed into cities in their own right, originated as suburban communities (e.g., Mississauga) developed on inexpensive land, with access to the high-capacity facilities within the regional road transportation system. From a planning and policy perspective, it appears there is work to be done in shaping land use, for commercial purposes, in and around the planned centres, in a way that will advance the region towards its goals of inclusive urban and regional systems where healthy people, living in healthy environments, can make sustainable decisions in the presence of sustainable alternatives. The entrenchment of power retailing, which predated the creation of the Growth Plan, threatens to undermine these goals. And if, as some have argued, the market for power retailing is at or nearing saturation, the task is not to prevent the creation of new power retailing outlets, but to find some way to reconcile existing power centres and power nodes with plans for Urban Growth Centres and with growth management goals more generally. 18. The findings partially reflect the effect of scale on analyses of this sort. The urban growth centres themselves are actually sub-areas of the broader region; the point locations used in policy documents to communicate the location of these centres are typically sited at key intersections. 19. The graphs were developed by combining estimates of vehicle kilometres travelled or trips with measures of proximity used to describe the location of individual retail facilities in relation to the Urban Growth Centres identified through the provincial planning process (Figure 13). 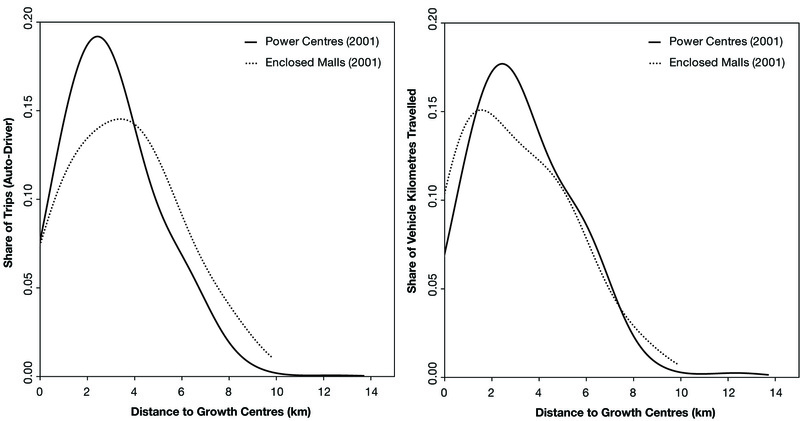 The results show the share of either vehicle kilometres travelled or trips (from home to TTS zones with enclosed malls or power centres), by distance to the nearest Urban Growth Centre. The data indicate the share of VKT or trips associated with a particular retail format, focused within and around the proposed Urban Growth Centres.